What exactly is stage skirting? 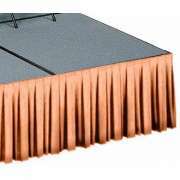 Skirting is fabric that covers the bottom of your stage to conceal supports and add style. At Hertz Furniture, you&apos;ll find a rich selection of beautifully-colored stage skirting that is striking in its sophistication as well as its affordability. For those planning an event that combines a stage element with a stylish luncheon or dinner, stage skirts, tablecloths and napkins can all be ordered in coordinating colors. Available in heights from 8" - 40" and custom-orderable in any length, Hertz Furniture&apos;s top quality stage skirting can be tailored to fit any performance platform. Do I really need stage skirting? You definitely need stage skirting if you want your portable stages to look professional and attractive. Our extensive collection of portable stages lets you choose the perfect configuration for your spaces. Portable stages are convenient for performances and events, but they are missing something when used without any added adornments. 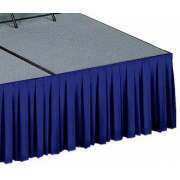 If you want to dress up your stage for more formal occasions or professional events, stage skirting offers a simple, budget-friendly way to attain your desired look. How do I put on a stage skirt? Our stage skirts are designed for easy application. They effortlessly attach to performance platforms of any size or shape via velcro strips. This convenient arrangement enables you to order a number of different styles and colors so you can choose the best option for every performance. You can coordinate the colors to particular organizations, backdrops or even what performers are wearing. Worried about where you are going to keep all of these stage skirts? Detachable skirting is easy to fold up for storage when not in use. How can I make sure stage skirting is the right size? A wide selection of skirting heights will fit virtually any temporary staging. Skirting ranges from 8”-40” and is ordered by the foot for a custom fit. A custom order ensures that stage skirts will fit perfectly for an attractive professional appearance. Custom-fit skirting that is properly attached will give your stage a more permanent and elegant appearance. It hides any unsightly wires or supports under the stage, so the audience can focus on the performance, lecture or service without distraction. What kind of stage skirt should I get? Our stage skirts come in a choice of styles. The right choice is entirely dependant upon function and preference. Box pleated fabric has an elegant effect. Shirred fabric has a soft delicate appeal that is perfect for formal occasions. Both shirring and box pleats are available in solid colors and tuxedo stripe. The unique effect of the tuxedo stripe creates a crisp classic look. No matter which fabric style you choose, our skirting comes in a huge selection of colors. Whether you use your temporary staging in the auditorium, gym, social hall, multipurpose room or chapel, our skirting can help you create the appropriate feel. Elegant tuxedo stripe fabric will look great on your church chapel stage. It can be coordinated with your chair upholstery or paint colors. If you need staging for performance purposes, a dark solid color is the way to go. This style will keep the audience&apos;s attention focused on the stage. 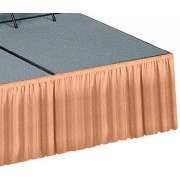 What kind of fabric is stage skirting made of? Worried about ripping, tears and stains? Because skirting rests on the floor, it is easy to accidentally get it dirty or damaged. Our stage skirting is made from top-quality spun polyester which feels and absorbs like cotton. Don&apos;t worry about wearing it out when you wash it. This unique fabric resists shrinking and fading like polyester, so it will maintain its attractive appearance for quite a long time. At Hertz Furniture, we ensure that the product you are getting comes from reliable manufacturers with many years of experience and expertise. Our stage skirts comes from the Tablecloth Company, which specializes in fabric skirting of all types. Their products are double-stitched for durability and specially-designed for your use and enjoyment. Beautiful stage skirting can transform a temporary platform into a professional performance space. Hertz Furniture&apos;s excellent selection of skirting offers you a number of wonderful custom-made choices, no matter what your style and preferences are. Not sure what size stage skirt you need or how exactly to take the correct measurements? Call the Hertz Design Center today for a free consultation and design-planning advice.